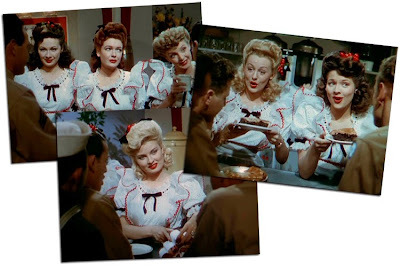 For today's Silver Screen Sunday, I'm going to take a little look at the 1944 film, Pin Up Girl. As you can see from the poster, it stars the most beautiful Betty Grable as 'Lorry Jones' a pin-up girl with a penchant for stretching the truth. One comment on imdb.com calls it 'somewhat entertaining fluff' and, whilst I must agree with that sentiment at least, I do not agree that the costumes are 'ridiculous, distracting and very unflattering'. The costumes are what made this film for me! 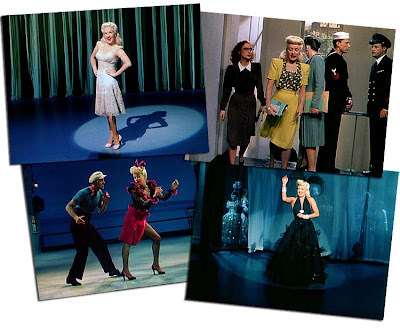 That and the fact that watching Betty Grable is just a delight in itself. Oh, and did I mention the unearthly amount of fabulous hairstyles? 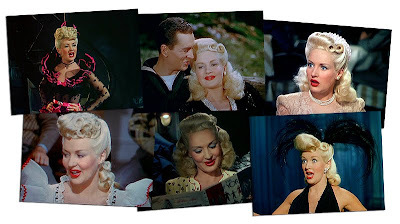 Whenever I watch this film I get a terrible case of hair envy – I remember screencapping it and staring longingly at all of Betty’s magnificent ‘dos, knowing I’m far too lazy to dedicate the proper amount of time necessary to perfecting some of the styles. Some of them are quite outrageous! Within the first minute there are, at least, six fabulous ‘dos (all of which, literally, have a cherry on top). And here are some of Betty's styles, which, of course, leave me equally envious. And some of her fabulous outfits. I don't know what I wouldn't do to have a dress like that first one - isn't it just too lovely? 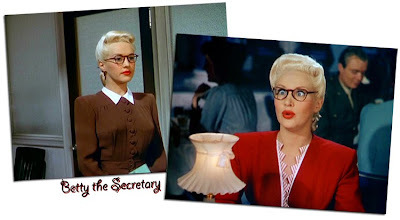 Betty looks equally as cute in her secretary ‘disguise’. I also wish I’d paid more attention to Martha Raye who plays Lorry's friend Molly - who, sadly, doesn't appear in any of these pictures - when I was doing the screencaps because she’s such a cutie! 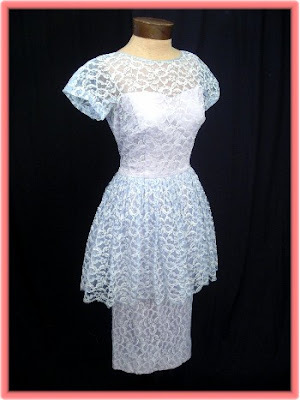 This pretty little lace dress reminds me of the dress Betty wears in the first club scene. 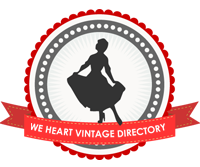 You can find it here, at Blue Velvet Vintage. 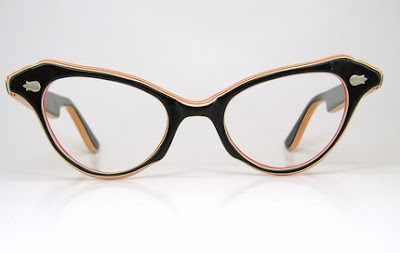 Or stop by this etsy shop and pick yourself up a pair of fab vintage glasses to get Betty's secretary look. This dress, by Stop Staring, (which I found here at Unique Vintage) is somewhat reminiscent of Betty's green and yellow suit. And this gorgeous halter kneck dress by Queen of Heartz (found here) makes for a simpler alternative to Betty's full-length gown. Fancy having a go at Betty's famous updo? 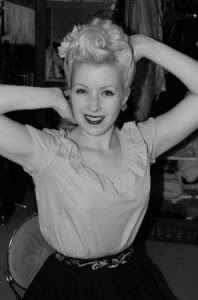 The lovely Miss Amanda Lee aka the Jitterbug Doll, did a tutorial for Queens of Vintage, which you can find here. Her tutorial provided the source of inspiration for my own (far inferior) 'do, today (which I inevitably I only took terrible photos of). Not too bad for a first attempt, I thought. 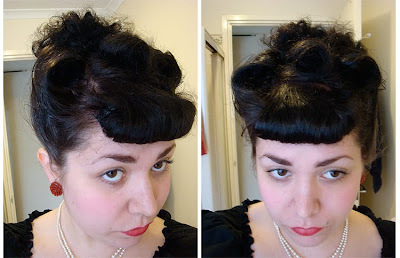 It was also the first time I used a rat to do the faux bangs (and I am aware that the bobby pins are visible). I hope that was an enjoyable post for you all! I am very sleepy as I spent most of the day at the Roller Derby (watching, of course) which I shall most likely post about tomorrow. i love the secretary look, very very cute! And I love the fashions in this movie--that cherry print ensemble is to die for! I think your hair is lovely! I love Pin Up Girl the roller skating scene just amazes me every time I see it! Pink Flower: Thank-you =] Oh, yes, I love that scene, too. I love the hair styles and the outfits in the film! And your first attempt at that style looks great. Jessica: Oh, I know exactly what you mean! And thanks ever so. =] I have a lot of fun doing them. Esme: Thanks! =D I'm glad you enjoyed this.